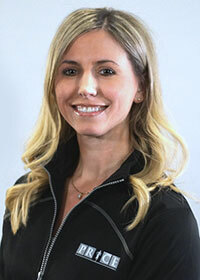 Born and raised in Waterloo region, Dr. Tara was actively involved in running, dance, cheerleading and group fitness. Her passion for health and fitness led her to pursue studies at the University of Western Ontario where she graduated with an Honours Degree in Kinesiology. After a bad fall at cheerleading practice and a history of back pain from scoliosis, it was Chiropractic care that helped Dr. Tara to get well and stay active. She decided to become a Chiropractor so she could focus on proactive/wellness care, help people move better and share her knowledge of the body and the importance of a healthy lifestyle. In 2003 Dr. Tara graduated from Canadian Memorial Chiropractic College (CMCC) in Toronto and opened up PRICE Chiropractic with her husband, Dr. Jason Price. Dr. Tara has been caring for her practice members for over 15 years and helps lead a team of health professionals with a common mission, to improve lives through health and fitness. Dr. Tara looks at WHY we function the way we do to fix the underlying problem and believes everyone would benefit from having a Chiropractor on their health team. Her treatment style includes soft tissue therapy (ART) and adjustments/mobilizations in combination with education, exercise and lifestyle advice to improve health & fitness. A caring Chiropractor and a mother of 4 boys, Dr. Tara knows first hand the benefits of Chiropractic care through the growing years. She has a passion for helping moms-to-be experience more comfortable and healthier pregnancies. Her prenatal practice brings her great joy as she absolutely loves helping women during their pregnancy and with their transition back to fitness. Dr. Tara is passionate about leading families to better health and wellness. For over 1O years Dr. Tara has enjoyed volunteering at her boys’ schools and with various sports organizations. She is well connected in the community and has volunteered at many races and charity events. Fitness has always been a big part of her life. She has over 20 years of experience working in the fitness industry! Dr. Tara loves to read self-care/high-performance books, listen to podcasts during her cardio workouts, strength train, run, bake and cheer on her boys’ hockey/school teams. “She represents the epitomy of health care, with a passionate approach to her own health and a compassionate approach toward the health of others. She maintains an active lifestyle and helps her patients achieve the same. Her level of knowledge in treating pregnant woman exceeds that of most, and she has a fantastic understanding of nutrition. “We took our 13 year old son in about an issue with his neck/jaw. She was extremely knowledgeable and more importantly she gave him exercises and stretches to help in between our visits. Because he is a 13 year old boy, he wasn’t doing his homework as diligently as he could have been. She is polite but firm kick in the pants was exactly what was needed. I have been a client for almost 10 years and have always had professional, informative and friendly service. I have learned valuable information from both of you that I can use in my day to day activities to help ensure a healthy and active lifestyle. I have always been pleased with the fast service I receive and the ease of getting an appointment to suit my timetable. I also trust them with the wellbeing of my children as they are both patients as well. You are awesome with my two young girls and have treated them many times for various injuries related to the competitive sports my girls participate in. My family are also patients of the massage therapist in the office and she is also very knowledgeable, friendly and excellent with my girls. Overall the friendly, professional staff are awesome and I would highly recommend them!- T. S.